You have added Lady In Red Ruffle High Low Dress into shopping cart. This bold and dramatic high low dress will definitely make an entrance at your next event! The Lady In Red Ruffle High Low Dress is fully lined to the mid-thigh and is made of chiffon. It has spaghetti straps, a crossover neckline with a snap closure in the front, and an elasticized empire waist. 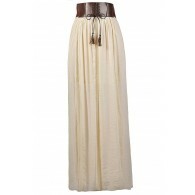 The attached skirt has a flowy high low cut with ruffle trim at the edges. An included fabric tie wraps around the waist and can be tied into a bow. This dress pairs well with strappy beige heels. Details: Fully lined to the mid-thigh. Shell: 100% polyester. Lining: 100% polyester. Dry clean only. Small measurements: Length from top of bust to hemline: 43-54". You have added Lady In Red Ruffle High Low Dress into Wishlist. You have added Lady In Red Ruffle High Low Dress for Stock Notification. You have set Lady In Red Ruffle High Low Dress as a loved product. You have removed Lady In Red Ruffle High Low Dress as a loved product.